TIG welding 80crv2 filler alloy? Here with another dumb welding question. I'm going to attempt to TIG weld a mild steel bar to a 80crv2 blade for a handle. This is before any grinding or heat treating. 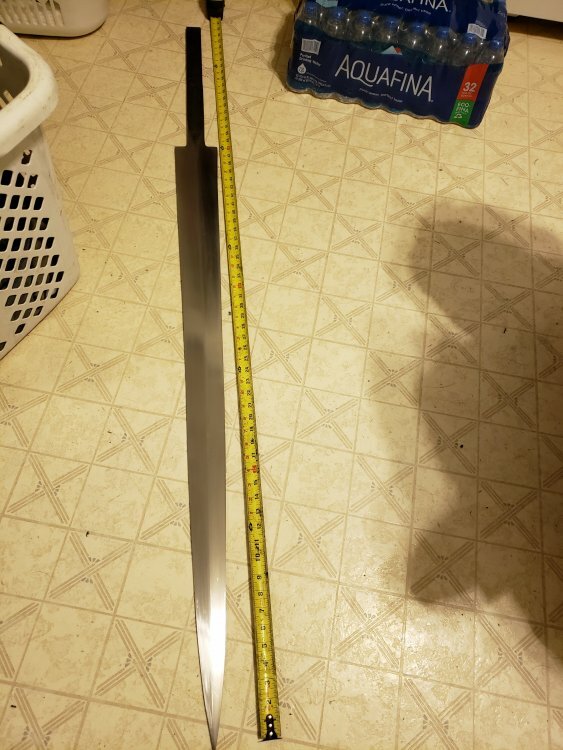 The weld will be forged and heat treated with the blade. Initially I was going to use ER312 stainless but realized it will be severely weakened by heating it. So my question is if ER70-s2 is a sufficient filler as long as weld is properly made and heat treated? Or is there a better filler for this purpose? This is simply an experiment to see if there is any viability to this so waste isn't really a concern. If you're wondering why I wouldn't forge weld it the honest answer is that I'm just really, REALLY bad at it. But I can TIG pretty well and I like to experiment with the limits of modern welding techniques. Any information is appreciated. Wow I misread that. ER70-s2 should work fine. although im not sure where to find it but alot of welders used to use 5160 on automotive welds as a filler. I'd just use mild as filler. Make a stub tang on the 80CrV2 , though, because there will be decarb and other heat-affected zone phenomena at the weld. This will even out during the following forging and heat treating steps, but the mild will pull some carbon out of the 80CrV2 where they touch. Because I don't have a TIG unit, I make a keyhole joint and braze it. The mechanical joint is strong to begin with, and the braze filler I use is around 80K PSI in tensile strength. It's not gonna come apart, in other words. Another option, since you mention forging it after the weld, is to just go with an autogenous weld (just melt the base materials, no filler). Wow I was honestly expecting to get some flak for this, but all the responses are super helpful. I have welded tangs in 2 different methods before the more classic stub tang with extension and a stranger method where I split a leaf spring halfway then spread it out to insert a mild steel core and handle extension. But the leafspring had considerably less carbon than 80crv2 and I just used 7018 to join them. Worked pretty well, at least nothing cracked or broke so far. With the 80crv2 I'll probably cut and groove a triangular notch to insert the mild steel into slightly wider than finished width so I can grind out the weld tail inconsistency. The blade will be all stock removal for the sake of eliminating any flaws that could be introduced with forging. 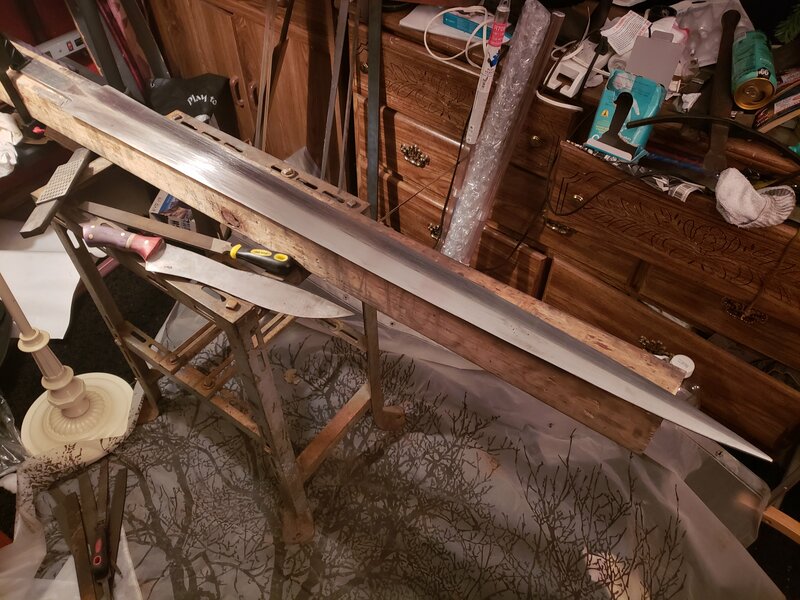 I'll note that the blade I'm making is like a large XVIII C sword with 4in width at the hilt with an initial thickness of 0.27in. And I'll probably leave that section for grinding after heat treat to hopefully cut down on carbon leakage. Again thank you for the responses. Been awhile since I've done it but here's the results. So far the weld hasn't shown any cracks or porosity. Pre-heated with a MAPP torch. Tig rooted with 70s2 and ground thoroughly. Filled and capped with fresh 7018. Used a kerosene burner to keep it out and moved it away incrementally for a slow cool down. Took a lot of filling but I can never get good results on my belt grinder with such a large blade. Now I'm looking for someone to give it a proper heat treat. I have crude equipment to do it myself but that introduces a lot of potential screw ups that I'd rather avoid. Anyone capable of giving this a good heat treating please contact me. I have plenty of brownells anti scaling compound I can send with it. As of now the measurements are 48in blade length, 18in tang, 4in blade width, 0.27 thickness. Doesn't have much distal taper. I wasn't finding any luck with getting a professional heat treatment so I went ahead and rigged up my own method. 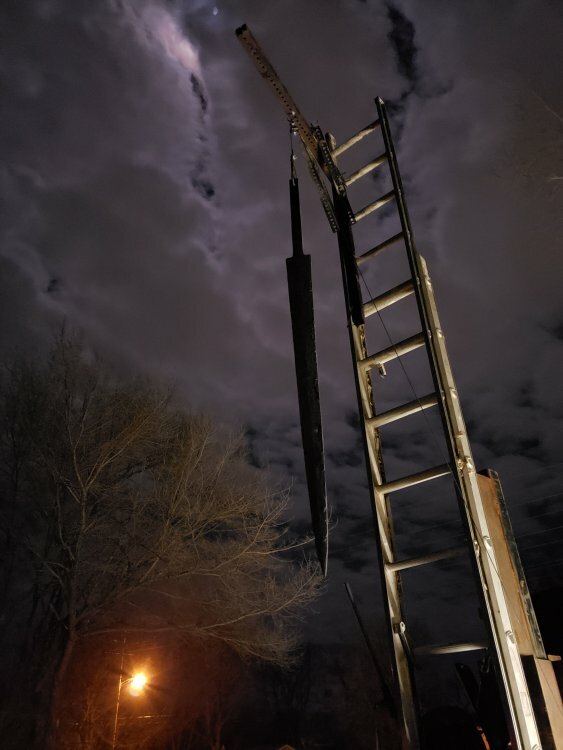 Strapped an extension ladder to my power hammer and strapped a makeshift boom arm with a pulley so I could work the blade with a cable through my vertical oven with much less effort. Gave it a few normalization cycles before dunking it in canola oil. The anti scale compound worked like a charm, all crude came off with 500 grit silicon carbide paper. Hopefully I can temper this monstrosity without screwing up all this work. I'll definitely use this cable method for all long blades I heat treat in the future. You absolutely must photoshop a lightning bolt into that photo!